I’ve had ALS ( amyotrophic lateral sclerosis) which is called SOD1 familiar disease. Diagnosed May 2013, for there is no cure. Genetically transmitted from my Father. He passed-away and was only 52 years of age. And I’m only 50 and fighting this terrible illness. I was healthy, didn’t smoke and exercised daily. Loved baseball and played unit 48 years young. It was the greatest thing, my son and I played together and how many Dad’s can say they turn a double-play, and batted after their son in the line-up, AAA division hardball an adult league. Priceless, is the only way to describe it. So as I was saying very healthy. I’m not knocking western medicine, but those pills made me feel like a zombie. So my beautiful wife, looked into alliterative treatments. So acupuncture was the discussion of the evening. 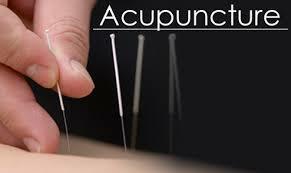 We found a Doctor in San Jose, California, Dr. Zhu’s Acupuncture medical & Neurology Center. Now for someone who has never had needles touch his body or head, you could imagine the look on my face when we arrived at his office. Everyone including his assistance had needles in their heads. If someone could have taken a photo of me I believe they would still be laughing. I looked at my wife and said, what were we thinking? I looked up and saw all his patients with needles sticking out of there heads. I said not me, my wife bless her schedule 4 section over the weekend so I said needles here I come. Now with this illness, your entire body feels tight and the fasciculations which caused so much fatigue for me, it has affected my legs, some may experience different parts of their body. I would say I walk like Frankenstein. So there I waited for my turn, I didn’t want anything sticking out of me when I left his office. Dr Zhu, called me in they took my blood pressure, the Doctor asked me if I was always overweight, which I thought I felt good at 191 pounds. I just laughed and said yes. After all the medical questions the acupuncture began, he started on my head and then work his way to my legs and arms. Felt like a pin cushion looking down at my body. It really didn’t hurt or sting, but what did happen is I felt electrical shocks going through my body as the needles were placed with precision. Now that the needles were placed, they brought in heat lamps and placed them over my body, which I felt using the heat from the lamps were transmitting the heat into the needles, like radio antenna’s. The process lasted for about an hour and a half, which felt like to me more than that. I have to admit for the first time after the treatment I felt more loose and not as tight, after the session I walked out of his office with needles sticking out of my head, and was smiling. I truly felt something while lying on the bed. I told my wife later that afternoon, my body felt like it was floating it was the strangest feeling, but very pleasant. 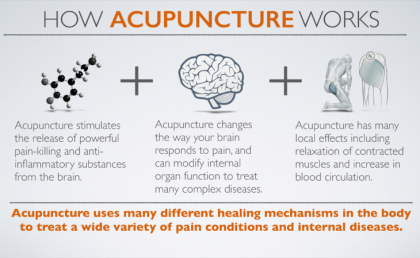 For everyone fighting an illness give acupuncture a try, keeping an open mind to things and believing this simple procedure may help you feel a bit better and when you feel better your family does too. And we all just want that. ← The Pros and Cons of an illness.